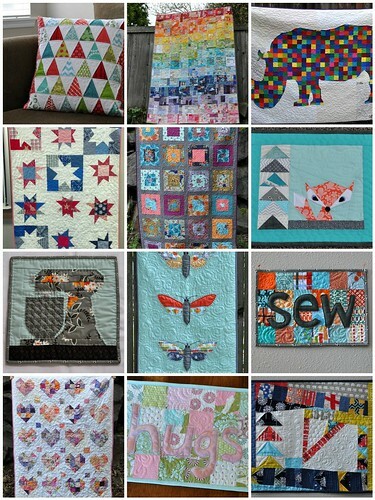 I finished up my #apqquiltalong quilt, back in May. 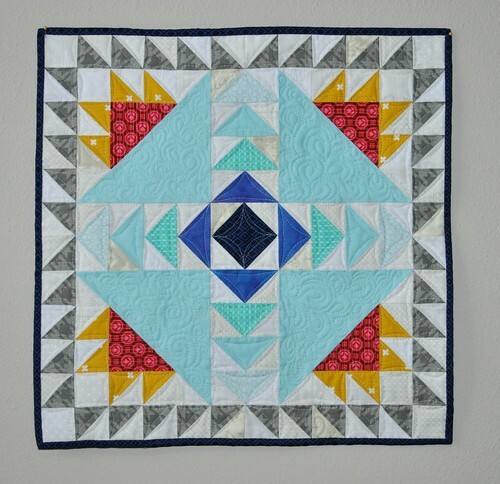 This was the quiltalong hosted in 2014 by American Patchwork and Quilting on instagram, called Tone it Down. 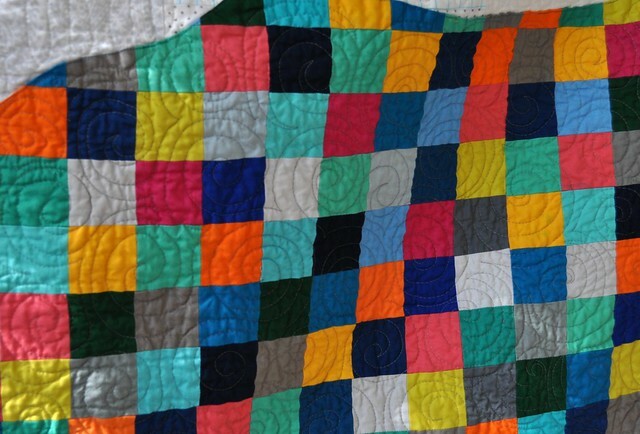 I had such a good time making this quilt. 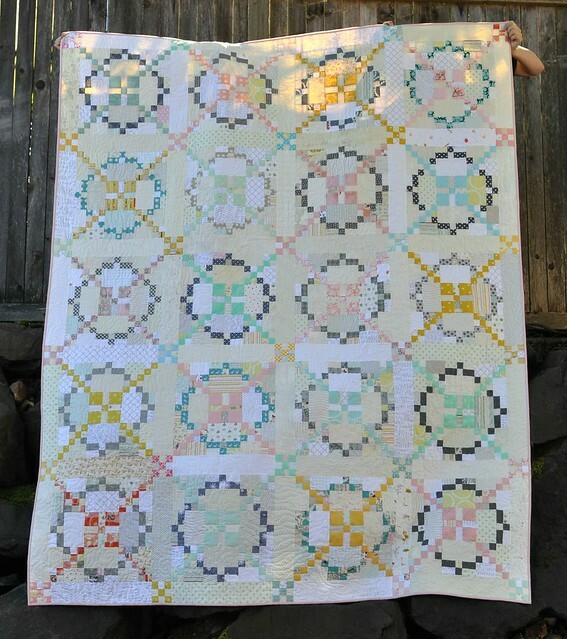 I was inspired by Svetlana at SOTAK's pastel version of this quilt but changed it up a little bit, ending with pink (on the coral/peach side), golden yellow, turquoise/aqua, and mint green along with a variety of grays. The background is all kinds of low volume fabrics; white or gray toned along with creamy off-whites. I think it worked. Some of my individual blocks, a couple of the yellows actually, were kind of uglies on their own but I knew that they would add to the quilt as a whole even if they were never going to be anyone's favorite. 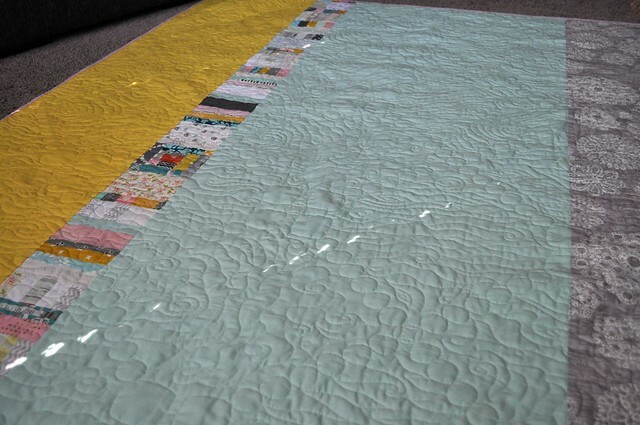 I machine quilted it on my Juki with waves and swirls. 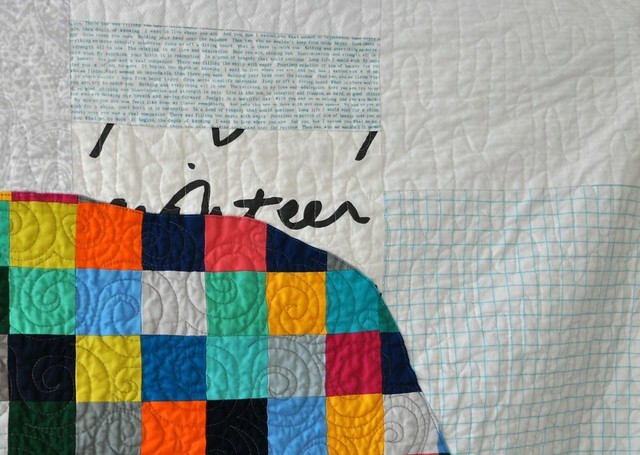 This quilt is big and quilting it was a challenge. I started and stopped a few times and that made it take forever. But I did eventually push through and complete it. I have one construction tip for next time (yeah, maybe) or if anyone reading is considering making one. 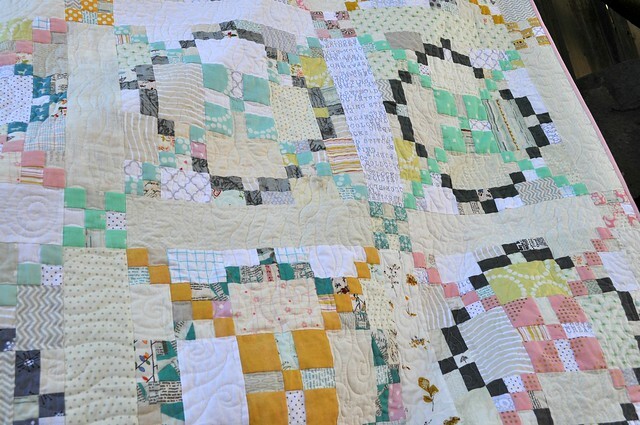 Don't cut the long sashing pieces until the blocks are all sewn and measured. 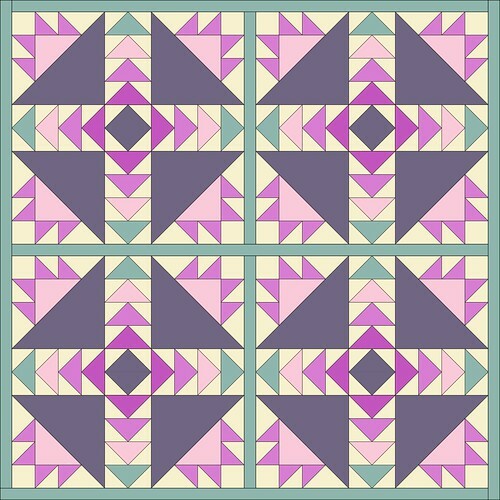 With so many small pieces, seam allowance is critical for this pattern, and while I was very consistent with my seam allowance, I was a tiny bit too scant and my blocks ended up about 1/8" bigger than the sashing measurement given in the pattern. And then, most of my sashing pieces were cut with the long side along the grain of the fabric, which means I couldn't really stretch them to fit. So I mostly eased the blocks to fit the sashing by sewing those seams with the block on the bottom. It worked out fine in the end, but would have been better to just cut the sashing a tiny bit longer to fit. 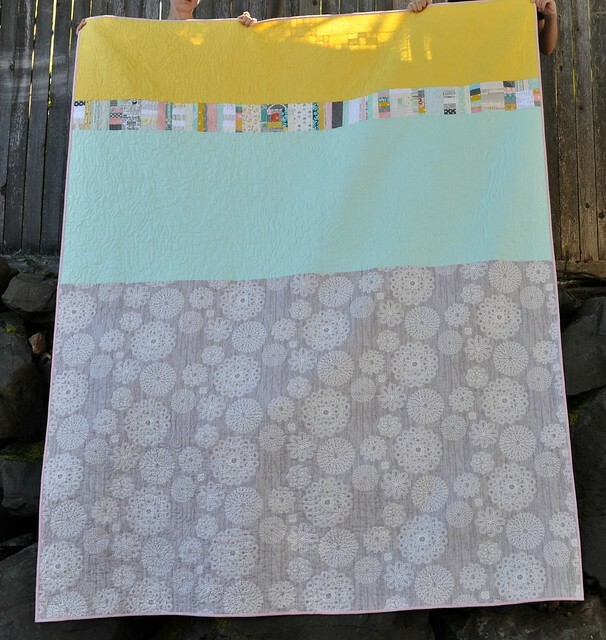 The back has a long pieced strip, a couple of Kona solid fabrics, and a Violet Craft doily print in gray-brown. Binding was a kona pink that coordinated with most of the pinks on the front. 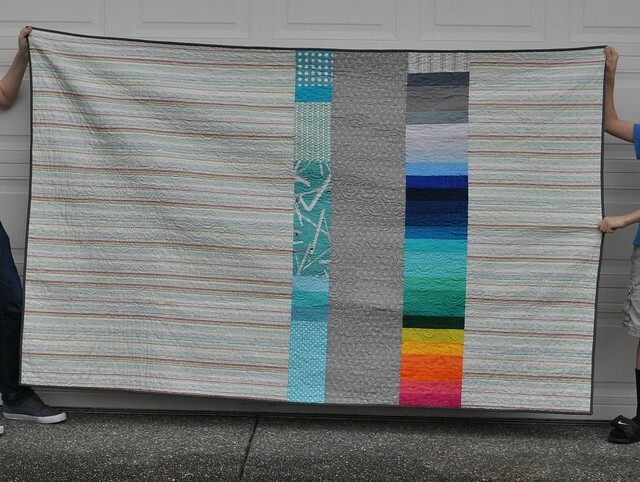 Overall, I had a great experience making this quilt. 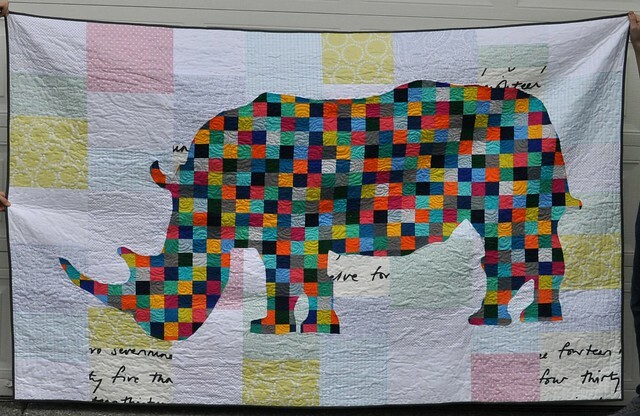 Each block is an accomplishment in this pattern, and completing the whole quilt (75"x93") is something I really feel good about! It's on my daughter's bed now, and I love the feeling the soft colors add to her bedroom. This giveaway is closed now, the winner is #40, Lindsay. Thanks for commenting! Hello friends! I'm back at the blog for Giveaway Day! 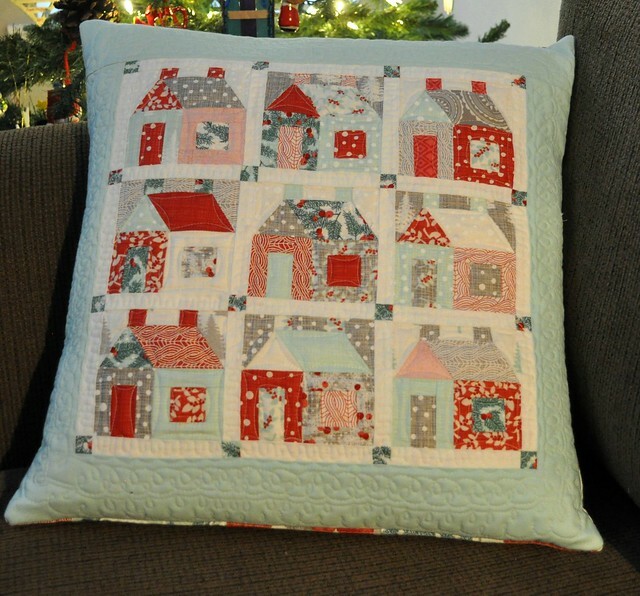 Sew,Mama, Sew hosts giveaway day (which lasts several days) twice a year, make sure to visit their page and check out all the handmade items and sewing supplies that are being given away this week. I've made a couple cathedral window pincushions this past week and last night I decided to finish this one up and give it away. 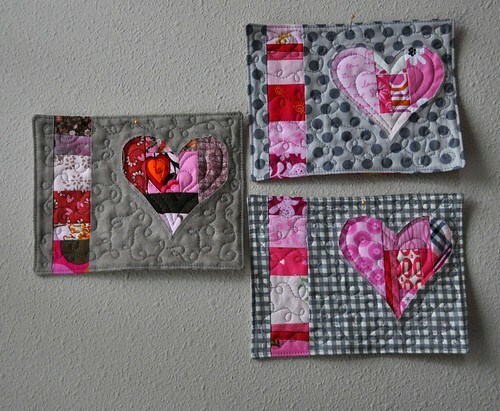 I'll include a little bundle of scraps, too. 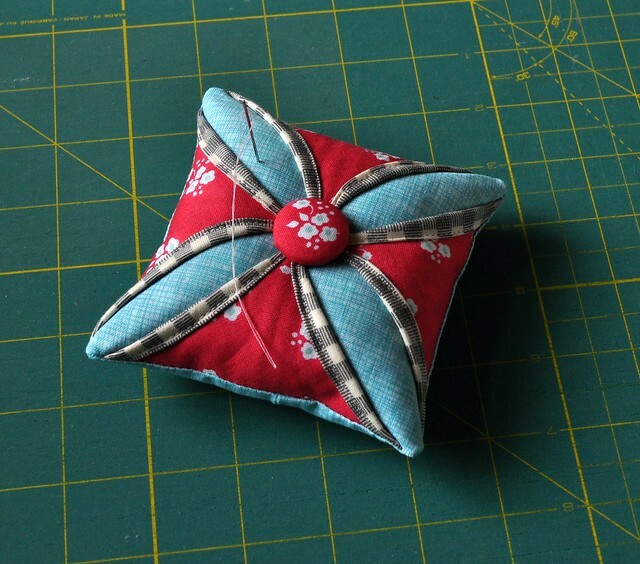 If you're interested in making your own pincushion, I used this Riley Blake tutorial to make mine. This giveaway is open to U.S. commenters, to enter please leave a comment telling me something fun you hope to do this summer. Comments will be open until May 10 at 5 p.m. Pacific time, and I'll update this post with the winner at that time. Comments are moderated so don't worry if you don't see your comment right away. Please make sure your email address is included in your comment if you're a no-reply commenter. Have fun with all the giveaways! I finished up 2 new Christmas stockings for my husband and myself about 2 days after we put away all our Christmas decorations. So I don't have photos of all five of our family's stockings together and the beginning middle of January is a weird time to share Christmas stocking pics but hey, I got them done and wanted to share. 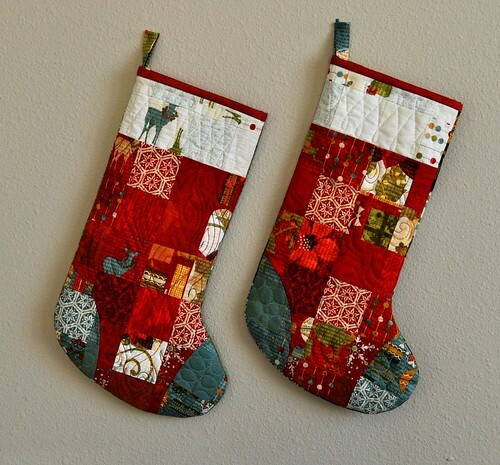 I used a charm pack of BasicGrey Christmas fabric from a few years ago to make these stockings, with the charm squares cut into 2.5" squares for the stocking fronts. For the backs of the stockings, I sewed together more of the 5" charm squares. 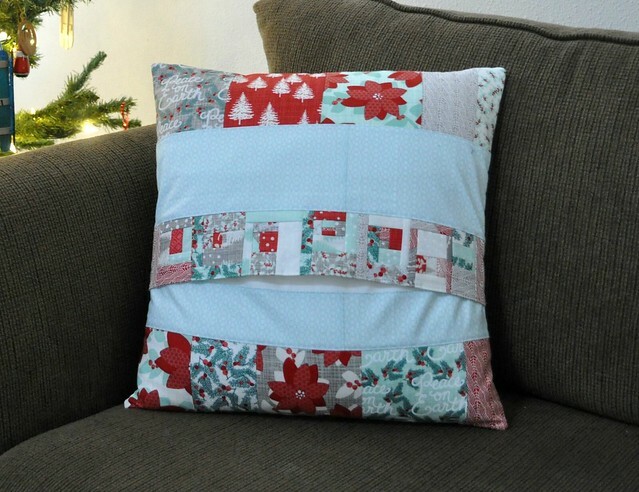 The backs of the stockings aren't quilted. 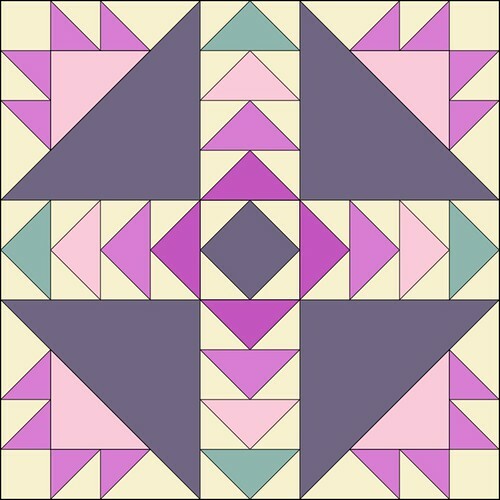 I originally made this pattern up about 12 years ago when I made a stocking my for oldest son. 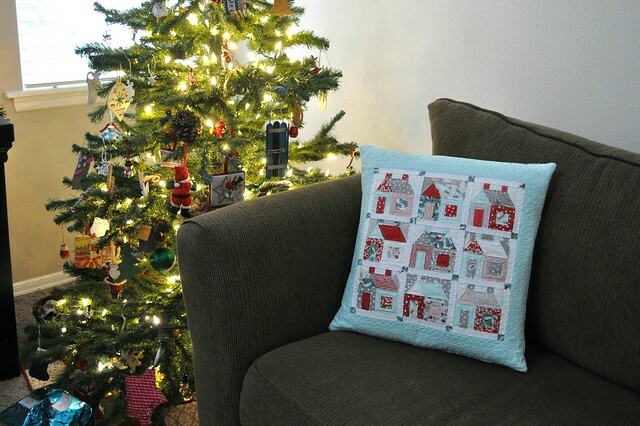 In 2010 I had finished my daughter's stocking and I shared the pattern and tutorial on the Sew We Quilt blog. Last month I tried to retrieve the pattern from scribd, a process which was free and easy in 2010, and in 2014 it was not so easy. 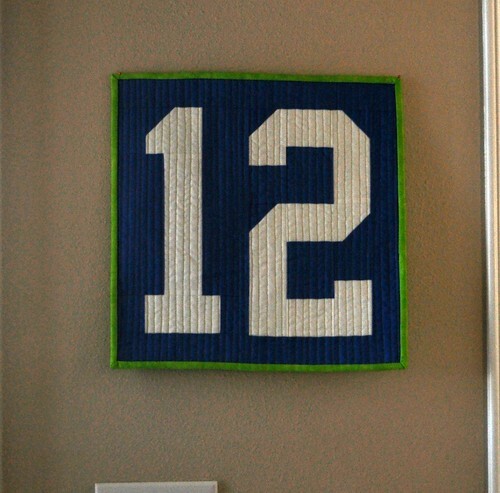 So I've uploaded it to Craftsy (for free) for your stocking making pleasure. 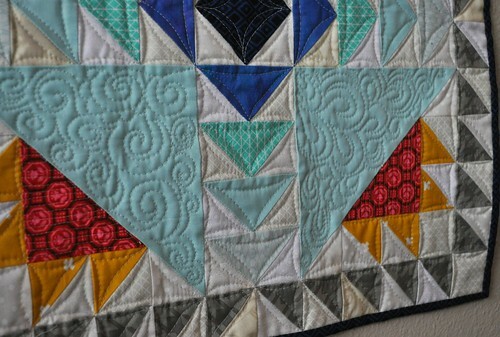 The instructions are still available here on the Sew We Quilt blog. 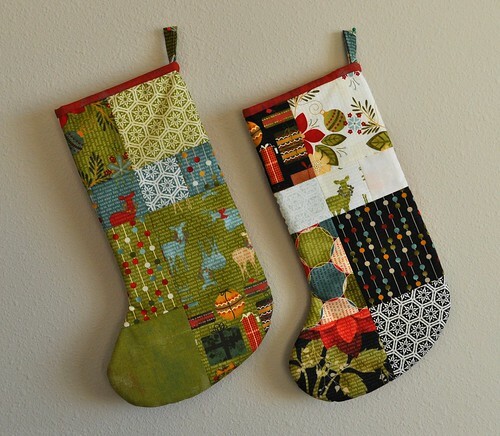 Here's the link to the stocking pattern. When you print the pattern, make sure page scaling is set to "none." 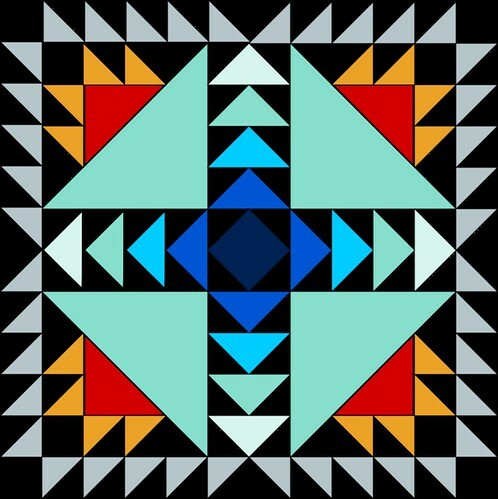 I'd love to see your stockings made from this pattern! 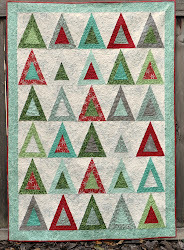 My main sewing goals for 2015 are to blog about my work in the Quilt Design a Day group, continue to create and post designs to the group, make a few of my QDAD designs come to life in fabric and thread, and make and sell some quilt patterns. Oh, and finish all my UFOs! j/k. Or maybe not. Here's to a happy and peaceful 2015.